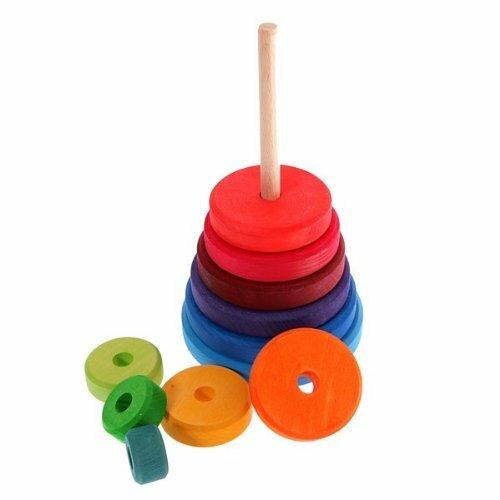 This Large Rainbow Tower from Grimm's is a wonderfully versatile stacking/sorting toy which will both amuse and stimulate children visually and mentally. 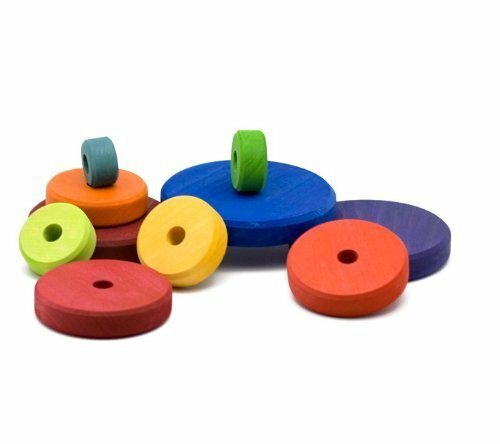 The simple design and bold colors allow children to be immersed in reasoning and creative thinking while developing motor skills and hand-eye coordination. Adults can guide the child's in discovery of concepts such as colors, size, ordering (an early mathematical skill), counting and more. 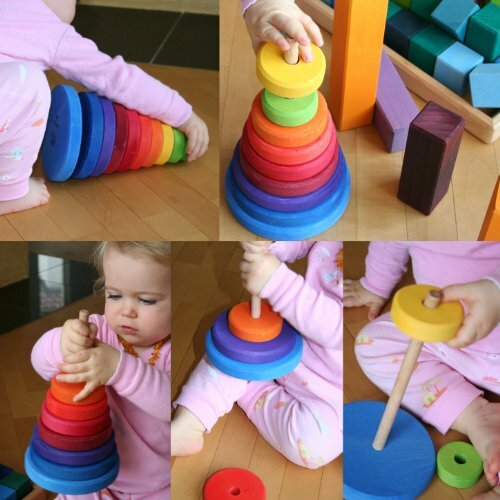 Children love to spend time stacking and unstacking the 10 rings on the tall base of this beautiful, naturally color-stained wooden toy. The vibrant hues and sizes of each ring graduate like a rainbow as they move from larger at the base and smaller towards the top. But you can stack them in any order you like! The Tower's ageless design and sturdy construction will last for generations. Measuring approximately 10-inches (25 cm) in height, this heirloom-quality piece comes minimally packaged in clear shrink wrap. Made of sustainably-harvested european wood that is stained with safe, certified non toxic, water-based stains (no paint or varnish!). Wood is an ideal material for a baby's first sensory impressions, plus bacteria has difficulty breeding on wood. This is especially true for non-varnished wood. So there is no need to worry if your baby or toddler wants to put any parts of this toy in her mouth.